Hey guys! I won't go into too much detail about how excited I am it's Monday because I know that that's not how the majority of people feel.haha But this week in particular I've been so excited about because Martin and I have SO many goals planned, and I've been waiting so long to get started! A lot of those goals have to do with organizing our life better and getting ahead, because heaven knows that I've been really feeling behind in a lot of ways lately (or rather the last six months or so.haha). Mixing blogging and all the work that goes with it (can I get an amen?) with keeping on top of our house, meals, chores, etc, and keeping the kids alive and happy at the same time can be pretty hard some times, so I need to cut corners whenever I can! 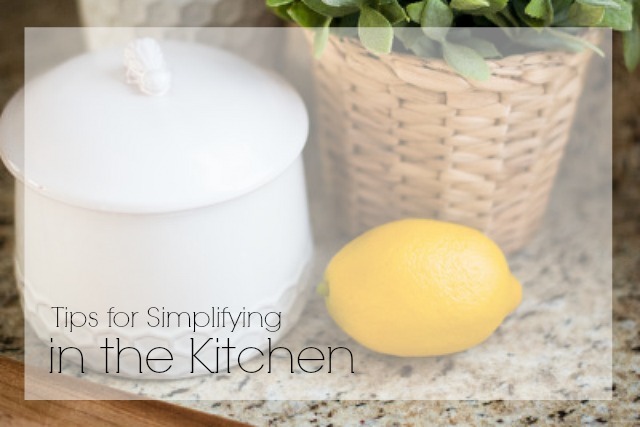 One of the easiest places to do that around here is in the kitchen. With Martin and I eating 5-7 meals a day lately, there's definitely more time spent in the kitchen than ever before, and keeping up with the cleaning while cooking, etc can get really tough! We do have lots of ways we like to save time though, and they make such a huge difference every day! One of our favorites is cooking in bulk and freezing the leftovers. I'll use this pot to cook 20 quarts of soup at a time (like in this recipe post here) and then I'll easily get enough for 10-12 other meals for the family. That's Huge! Another thing we like to do is instead of bringing out all the ingredients to make a recipe and letting the mess accumulate while prepping it (we all know the disaster I'm talking about), we take each ingredient out to use and than put it away before getting the next, and as we finish with a measuring spoon or other tool we put it directly in the sink after use. Then you can slide your bread into the oven or put the soup to simmer with a completely clean kitchen! We really value our time-saving kitchen tools like our flex cutting boards (easy transfer of veggies to the pot), our different sizes of ice cream scoops(awesome for getting fast and uniform cookies, muffins, and other baked goods), and our kitchen scale makes measuring out grams, ounces, and pounds so fast and easy. Our knife magnets above the counter are a life savor when you ave sticky hands and don't really want to dirty up your drawers in order get at a knife, and I love to keep scissors on there as well for quick snips and I can just put them right back! Coupons.com is giving away 4 amazing prizes! 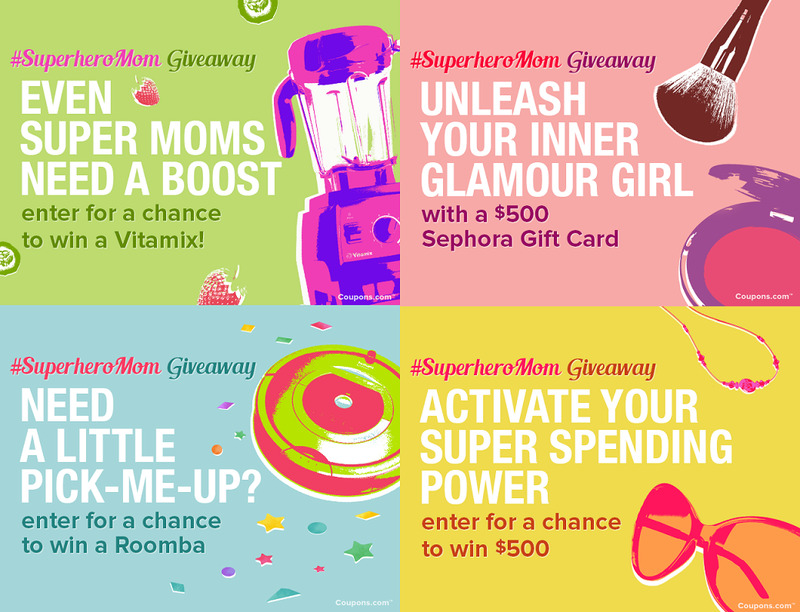 You can win a Vitamix, a $500 Sephora Gift Card, a Roomba and a $500 Cash! How awesome would this be for Mother's Day for yourself or for the Mother in your life! I can think of quite a few ways I could use each of these prizes. If you haven't heard of Coupons.com, you need to check them out. They have some great coupons for just about everything on your grocery or shopping list. Make sure you print some out before your next trip to save some extra cash. Also, now Mother's Day is approaching fast and I know not everyone has a gift for the Mom's in their life yet. Make it easier for you to check out their Mother's Day Deals for not only great ideas on gifts, but also some great prices too. In addition to these 4 amazing prizes, you can win a $200 Gift Card to Williams-Sonoma! Enter down below today! I've teamed up with 20 bloggers to host this giveaway and hope you all enter to win! Thanks so much for visiting, and i"ll see you back here tomorrow for something really fun!